Ady Advantage has seen the future of economic development, and although the key players are the same – companies, talent, and the communities themselves – the model has literally reversed itself. 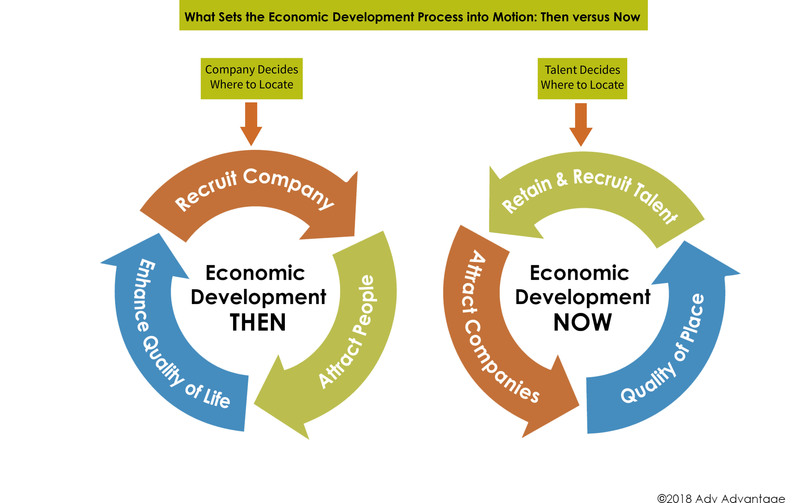 The diagram below shows how we have moved from economic development that is led by companies to one that is led by talent. The traditional economic development model relied on company recruitment, after which the workforce would follow. In this new model, companies choose where to locate and expand based on availability and productivity of talent; and talent, in turn, decides where to locate based on quality of place and other factors. Stage 1: Denial. Some employers deny reality – hoping that things will just get back to normal soon. Stage 2: Disengaged. Disengaged companies recognize that they are affected by long term, systemic talent trends, but have not yet taken responsibility for addressing the effects of those trends. Even if they serve on workforce boards or attend talent conferences, they still see themselves at the end of a talent pipeline that other institutions are responsible for priming. Many employers expect workforce development organizations and institutions of higher education to solve their talent problems for them. In the past couple of years, many of these “supply side” institutions have in fact better connected to the “demand side” of the talent equation. Our proprietary database of over 200 talent strategies includes many exampled of very effective talent programs developed by these types of organizations. 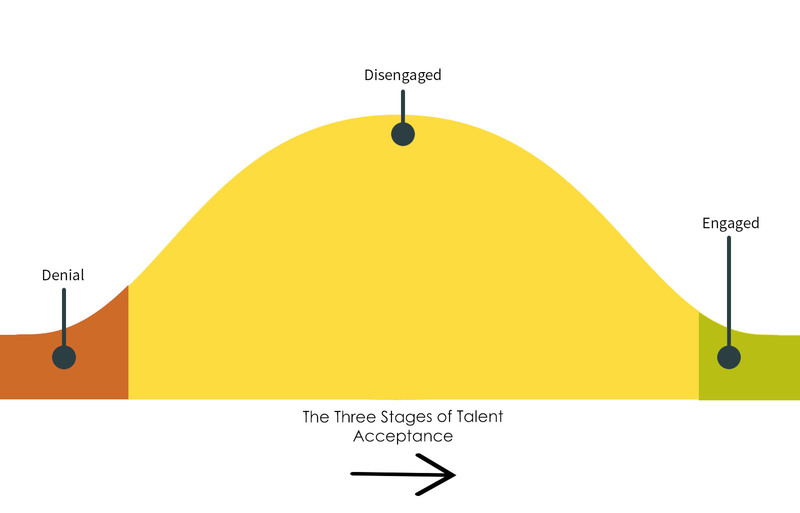 Based on our experience, the progress these “supply side” organizations have made is what is turning the spotlight back on the companies themselves (the “demand” side) and prompting employers to reach Stage 3. Stage 3: Engaged. This is the stage where the most forward-thinking and outward-focused employers are today. These are the companies that realize that they need to support shared talent initiatives, and even to spearhead internal initiatives related to talent engagement and development. They participate in regional talent initiatives through their local or regional economic development organizations (EDOs). Companies are volunteering to pilot new programs and initiatives or providing feedback on those under development or already in progress. Engaged companies serve as a role model and advocate for the talent “ecosystem” in their community. They encourage other employers to dedicate time and resources to help talent initiatives achieve critical mass. They help “connect the dots” between similar needs. For instance, a community brand can be developed with consistent messaging and tools that help each employer retain and attract employees. They respect and support the work that other organizations do to advance talent initiatives. They encourage organizations working on talent initiatives to align around common goals and to eliminate redundancies or gaps. Engaged companies take responsibility for their part of the talent equation. They understand and acknowledge the priorities of their existing employees. For example, there is much research to suggest that today’s employees value flexibility, diversity, inclusion, transparency, authenticity and collaboration. These desires are not limited to white-collar, high-tech employees in major metro areas, but are valued by all kinds of employees. They adapt their culture to help retain and attract talent. Employee engagement is often identified as a key success measure for companies attempting to change their culture. We’d welcome a conversation about how to promote greater talent engagement at your company, or at the companies you work with. Give us a call today.